Lil Wayne celebrates his 35th birthday today (Sept. 27), a milestone that feels incredibly young, especially considering just how much the hip-hop veteran has impressively accomplished throughout the past twenty years. With fans and colleagues alike sending the rapper birthday greetings throughout the day, it was only appropriate for Drake to also pass along a kind message commemorating the special occasion. Taking to Instagram, Drizzy posted a throwback photo of the Young Money founder sporting an OVO hoodie, adorning the flick with a heartfelt caption saluting his mentor, friend and boss. "Happy Birthday bossssssy!" the 6 God captioned the post. "Thank you for the endless tools and the inspiration! I would have been lost at how to maneuver this game without watching you do it first. I remember when they told you that it was impossible to build a skate ramp on your roof...and then I came back and you were skating on your roof. Please never change. Love for life." 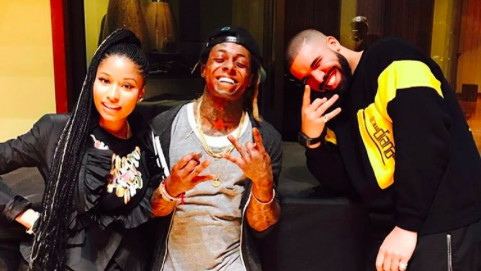 Earlier this month, Drake made his allegiance to Lil Wayne permanent, by way of inking a portrait of the rapper on his upper left arm (see above). Yup, the love is real. Take a look at Drake wishing Lil Wayne a happy birthday below.